Millions dream of breaking into the fashion design industry, but only a select few are destined to make it. What makes the difference? It’s simple really – grit, determination and making all the right moves along the way. It’s natural to assume that those working at the highest levels in fashion simply fell into their roles by pure chance. In reality however, the vast majority had to work incredibly hard to claw their way up the ladder, having started out in an entry-level capacity. Even with all the creativity and vision in the world, it is still very important to study the industry as a whole. It’s one thing to know how to put together an impressive design – it’s something else entirely to know how to get your work in front of the right people. These days, there are endless classroom-based and home study fashion design courses available to suit even the busiest lifestyles. The better you understand both the industry and the profession, the higher the likelihood you’ll get where you need to be. Employers are often more interested in practical experience than they are qualifications and certification. Which is precisely why it is in your best interests to gain valuable work experience by any means necessary. This more often than not means being willing to work for free, but given how you stand to be rewarded long-term, it’s a small price to pay in the interim. Having the opportunity to demonstrate your skills, talents and passion is quite simply priceless. Building your personal brand means knowing exactly what it is you intend to accomplish, the statement you intend to make and the image you intent to live by. You need to quite literally live and breathe your brand on a 24/7 basis, in order for anyone else to take you and what you do seriously. How you choose to build your brand will determine your primary target market, the opportunities available to you and the challenges to expect along the way. Try to remain level-headed and remember that overnight success is not a realistic possibility. If you genuinely expect to begin climbing the ladder immediately after beginning your journey, you are setting yourself up for a big let-down. At a time when spending money on marketing or PR really isn’t an option, social media can be your best friend. To build a strong following on social media is to benefit from the kind of influence that can make all the difference when it comes to career progression. Social media gives you the opportunity to showcase who you are and what you do in front of a global audience – 100% free of charge. Social media is an incredibly powerful marketing platform that demands only your time, as opposed to your money. Contrary to popular belief, the fashion industry isn’t all about champagne runway shows and magazine shoots. Along the way, it is inevitable that you will encounter plenty of setbacks and knock-backs, which you’ll need to learn to deal with. Getting by in the fashion industry means having incredibly thick skin and acknowledging the fact that not everyone is out to help you. If you are serious about taking your brand and business to the highest possible levels, you really should think about teaming up with at least one other person. Having a business partner to bounce ideas off and generally assist with every step of the process can be more valuable than any other assets available to you. Think about Christopher Kane and his sister Tammy, Marc Jacobs and Robert Duffy, Alexander Wang and his brother Dennis – the list goes on! It’s no secret that the fashion industry is no place for shy and retiring types. Quite the contrary in fact, in order to stand any chance of being noticed at all, you need to get your face out there as much as possible. The way you both present yourself and interact at every available opportunity will have a direct impact on the way your brand is interpreted. You need to be ready, willing and able to talk openly about your brand, your vision and your values at all times. Much as it may sound counterproductive when you are focusing on your future career, finding gainful employment in the interim is extremely important. And for two very good reasons – the first of which being that the likelihood of turning a profit as a fashion designer early on is minimal to say the least. On top of this, regardless of the kind of job you take up in the meantime, you are guaranteed to gain valuable experience and ensure there are no unwelcome gaps on your resume. While it’s of course important to follow your primary passion and talents, it’s also a good idea to consider current demand. The reason being that if you decide to go into upmarket womenswear design, you are going to face extraordinary competition from thousands of new graduates every single year. By contrast, designers who specialise in accessories, sportswear and men’s clothing in general are in much shorter supply. The less competition you’re up against, the better your chances of succeeding in your goals. You’d be forgiven for thinking that the world’s leading fashion brands are sick to the back teeth of newcomers to the industry, approaching them in the hope of scoring a job. However, there’s a big difference between firing off the same CV to a thousand different designers and actually scripting a thoughtful proposal to present to one specific designer in person. You have to remember that budding designers have on occasion purchased return flights to the other side of the world, simply to hand-deliver their proposals and portfolios. And while it’s an expensive approach, it has certainly yielded positive results in the past. Try not to narrow your options too much when it comes to where and in what capacity you are willing to work. You may have your eye on New York City, but if you are also willing to work in say Germany, Spain, Japan or even Australia, you stand a much greater chance of securing a professional position. Likewise, even if you are offered a position that you feel falls below your experience and expertise, remember - you’re playing the long game here. The fashion design industry is the dictionary definition of a sector where who you know can be more valuable than what you know. Which is precisely why it is in your best interests to begin networking like crazy from the earliest possible stage. Each and every name, telephone number and e-mail address you add to your database represents one more person that may be able to throw a golden opportunity your way. Attend events, organise your own events and never pass up the opportunity to make new contacts. It goes without saying that anyone taking an interest in you and your brand will most definitely scour through your social media accounts, before considering making you an offer. You really never know who might be looking at your online profiles of any one time, or how your online presence is interpreted by others. Along with polishing your profiles in accordance with your brand, be sure to get involved with other leading industry networking sites, such as Fashion Unitedand Fashion Industry Network. Along with your own business website featuring the most prominent examples of your work, you will also need to sign up with as many portfolio sites as possible. A few examples include Arts Thread, Coroflot and Style Portfolios– all of which significantly increase the likelihood of your work being seen by the right people. If you yourself are not up to the job of creating an outstanding online portfolio, you need to hire someone who is. Once you have established your own personal point of view, it is imperative that you stick to it like glue. If at any point in that comes apparent that you have shifted radically or changed directions for purely commercial/professional reasons, you are likely to lose credibility in the eyes of those who matter. Design directors and hiring managers are constantly on the lookout for those that not only have their own unique aesthetic and point of view, but are relentlessly committed to what they believe in. Before even thinking about presenting yourself to a potential employer, carry out extensive research and learn as much as possible about both the brand and its collections. As a designer, you will be expected to keep up with every key development spanning not only the brand you work for, but every major designer in your field. Employers therefore like to see that you have been proactive, in keeping up with their latest work and industry trends in general. If you’re not already up to speed with sketching, sewing and the practical mechanics of fashion design, you’ll need to brush up beforepursuing a professional position. 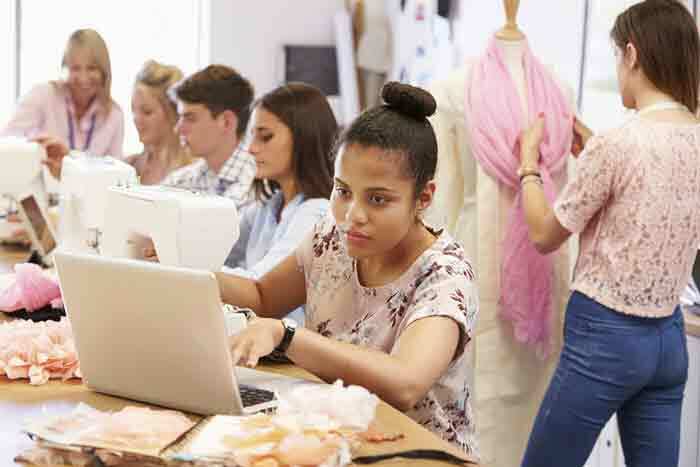 Once again, there are countless classroom-based and online fashion design courses available right now that can help get you up to speed. Last but not least, never forget that in becoming a fashion designer you are transforming yourself and your brand into a living, breathing business. You’ll find it extremely difficult to get by if you do not know the first thing about running a business – precisely why it can be beneficial to team up with at least one other person. From manufacturing to marketing to budgeting to essential PR, there’s much to succeeding as a fashion designer that technically has nothing to do with fashion design.